The United States Congress designated Theodore Roosevelt Wilderness (map) in 1978 and it now has a total of 29,920 acres. All of this wilderness is located in North Dakota and is managed by the National Park Service. 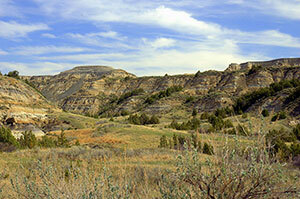 Divided into three units along the Little Missouri River, Theodore Roosevelt Wilderness encompasses the heart of the scenic North Dakota badlands. Eons ago, when the Rocky Mountains emerged, material washed off the range and was deposited here, forming a plain. Centuries of wind and rain carved the badlands into the broken, colorful splendor of today's badlands. Theodore Roosevelt himself had a cattle ranch here in the 1880s, and the ranch headquarters is preserved in the small Elkhorn Ranch Unit of the Theodore Roosevelt National Park. The Wilderness and park bears the former president's name in honor of his experiences in the badlands and his conservation legacy. The Wilderness preserves outstanding badlands geology, a petrified forest, mixed-grass prairie, and a wide variety of wildlife species. Much of the South Unit west of the river and most of the North Unit is Congressionally designated Wilderness, and these areas provide a home for a multitude of wildlife including bison, elk, mule deer, whitetail deer, pronghorn, bighorn sheep, coyotes, prairie dogs, sharp-tailed grouse and eagles. Ninety-five miles of trails offer ample opportunity for solitude, as most visitors stay on park roads and in established campgrounds. In spring, when snowmelt fills the river, paddling can be excellent, although water levels vary and it is sometimes difficult to plan ahead. Planning to Visit Theodore Roosevelt Wilderness? How to follow the seven standard Leave No Trace principles differs in different parts of the country (desert vs. Rocky Mountains). Click on any of the principles listed below to learn more about how they apply in Theodore Roosevelt Wilderness.